Tawan Views offers international property buyers the best of both worlds. A sophisticated holiday retreat and tropical home that will be the envy of friends and colleagues, as well as an astute investment that will repay itself many times over in the years to come. Choose from a combination of stunning penthouses and apartments, stepped into a rising landscape, with sweeping vistas of Phang Nga Bay. The design is ultra-chic: stylish open living spaces flowing through to expansive terraces with uninterrupted sea views. Tawan Views is developed by Tawan Properties, widely regarded as one of the island's leading developers. 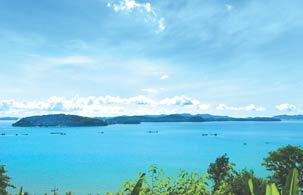 It has a proven track record for creating prestigious residential and resort communities in Phuket. International property managers will manage the estate with an on-site office and management team. They will provide a full range of estate management services as well as rental and management facilities for individual owners. Tawan Views represents the first opportunity to be part of a uniquely contemporary development on the east coast, as well as an outstanding investment choice. Golfers are spoilt for choice with several great courses including Blue Canyon Golf Club, often rated the best in Asia, Phuket Country Club and Mission Hills. The east coast is home to three superb marinas, two of which feature extensive shopping, dining and entertainment facilities. An array of beautiful islands, providing spectacular vistas for residents of seafront properties such as Tawan Views, are dotted along the coast. A five-minute long-tail boat ride across invitingly clear water will take you to a choice of sandy beaches. Surrounded by lush natural vegetation, the 24 apartments and penthouses are in six blocks, stepped into the site to ensure sea views from all of the living areas and bedrooms. Architects, KplusK, created a design that engenders a spirit of Thai living within a very contemporary tropical environment. Tawan Views will appeal to buyers who appreciate local materials, such as timber and sandstone, but not the neo-Thai adornments found in many Phuket developments. Spacious, light-filled rooms open on to wide, private terraces. Cooling sea breezes flow though the living spaces, creating a sense of liberation and a direct dialogue with the sea and the surrounding landscape. Each apartment boasts 208 sq m of living space, with more than 50 sq m of generous balconies, stretching across the entire frontage. To enhance the connection with the sea, the terraces have frameless toughened-glass balustrades so there are no visual barriers to break the sea views. Tawan Views will be managed by Thailand's leading property management company CB Richard Ellis. The company's experience and knowledge of managing residential condominium projects is substantial, which means owners can be assured that the day-to-day running of the estate will be professional and efficient.